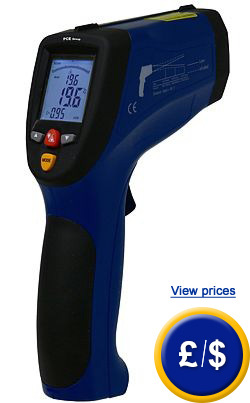 The PCE-891 double laser infrared thermometer has a temperature range from -50 ºC to 1370 ºC. The infrared thermometer has an optical resolution of 50:1 that allows an accurate, non-contact measurement of the temperature of small surface areas. 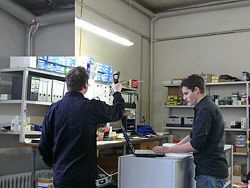 Using the infrared thermometer, temperature can be measured for heating and cooling systems without the temperature of surrounding surfaces influencing the measured value of pipes. The double laser infrared thermometer can be used in the automotive industry, e.g. to quickly and accurately test MOTs. It can also measure recently painted surfaces without leaving marks as a result of taking the measurement. The double laser infrared thermometer can be used for preventative maintenance in other industrial fields, since it is ideal for measuring moving components or those under tension. 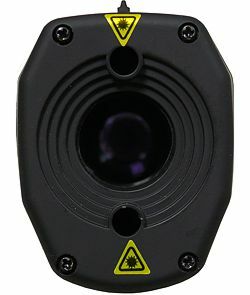 One unique aspect of this device is that it has a response time of less than one second without having to touch the object being measured. This double laser infrared thermometer can also be used within the food industry to prevent the contamination of food products. The infrared thermometer comes with memory and USB port for real-time registration of measurement values. Apart from non-contact measurements, this thermometer can be connected to type K sensors to measure temperature. The double laser infrared thermometer offers the ability to adjust alarm limits and emissivity (information about emissivity) relating to the object being measured. At the following links you will find a table with emissivity for diverse materials and another with emissivity for non-metallic materials. Here you will find more information about different infrared thermometers to measure temperature. Here you can see the optics of the double laser PCE-891 infrared thermometer. Operating conditions 0 ... +50 ºC/10 ... 90% H.r. 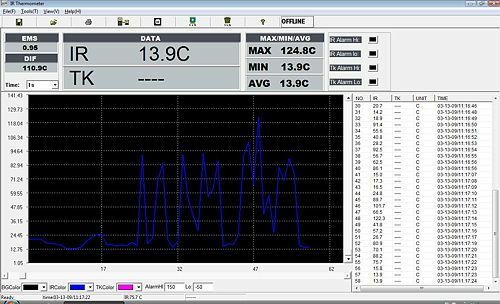 The infrared thermometer measuring the temperature and making an analysis through the software at the same time. 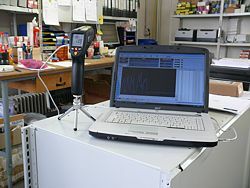 The double laser infrared thermometer connected to the software. Here you can see a screen shot of the software for the valuation in real time of the measurement values (in graphic and chart). 1 x Double Laser Infrared Thermometer (PCE-891), 1 x software, 1 x thermal sensor, 1 x interface cable USB, 1 x carrying case, 1 x 9 V battery and user manual.